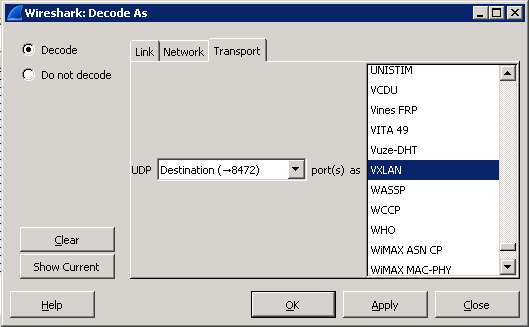 In this short post we will look at capturing packets that are encapsulated with the VXLAN protocol and how to decode them with wireshark for troubleshooting and debugging purposes. This procedure is handy when you want to analyze network traffic on a logical switch or between logical switches. The limitation with the current version of pktcap-uw is that we need to run 2 sets of commands to capture both egress and ingress. With that said lets get to it.. In this environment I will capture packets on vmnic4 on source and destination ESXi hosts. Once decoded wireshark will display the inner source and destination IP address and inner protocol. I hope you find this post helpful, until next time! !